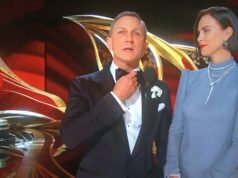 Though Daniel Craig didn’t wear a suit to the Spectre announcement last week, he wore suits to the press conferences announcing his first three Bond films. At the Quantum of Solace press conference we got a preview of the suits to come in the upcoming film. At the Skyfall press conference on 3 November 2011, Craig wore a Tom Ford suit that was a like a mix of the Quantum of Solace suits and Skyfall suits that were to come. It was a dark grey herringbone two-piece suit, and the jacket was a button three with the lapels rolled to the middle button like on the suit jackets in Quantum of Solace. Also like on the Quantum of Solace suit jackets the flapped pockets are straight and include a ticket pocket, there are double vents, there are five buttons on the cuffs with the last one left open, and the lapels are a medium, balanced width. The trousers are have a flat front, turn-ups and slie-buckle side adjusters. The fit of this suit, however, is more like the suits in Skyfall. The jacket’s shoulders are narrow and straight, the length is a little short and the fit is very close overall. 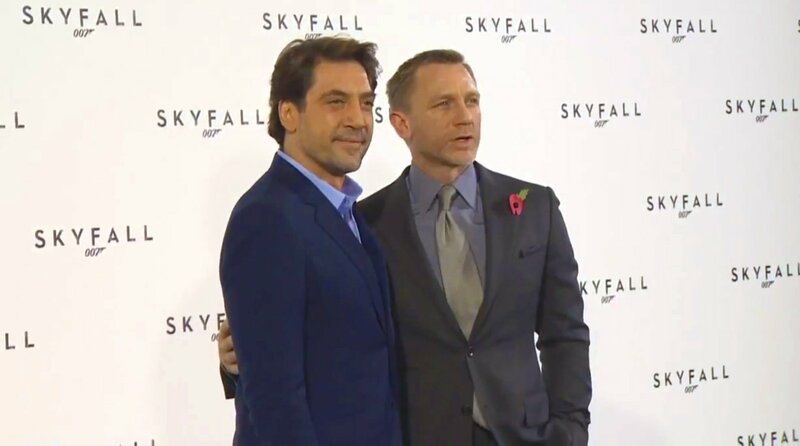 But the fit is not quite as tight as the Skyfall suits are. There is a little pulling at the sleeves and waist but not nearly to the extent that the jackets in film pull. The jacket fits very closely, but Daniel Craig doesn’t look as if he is about to burst out of it like the Hulk. 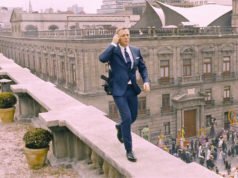 The trousers have a low rise and narrow, straight legs like on the Skyfall suits. Whilst they pull a little around the thighs, they still hang straight. The suit still doesn’t fit as well as the suits in Quantum of Solace fit, but it shows how a fashionable “slim-fit” suit doesn’t necessarily have to fit so poorly like the suits Skyfall do. Slight adjustments to this suit could kept the “slim-fit” look whilst keeping Bond well-tailored in Skyfall. Perhaps the suits in Skyfall were intended to fit more like this suit does and Daniel Craig bulked up more after being fitted. 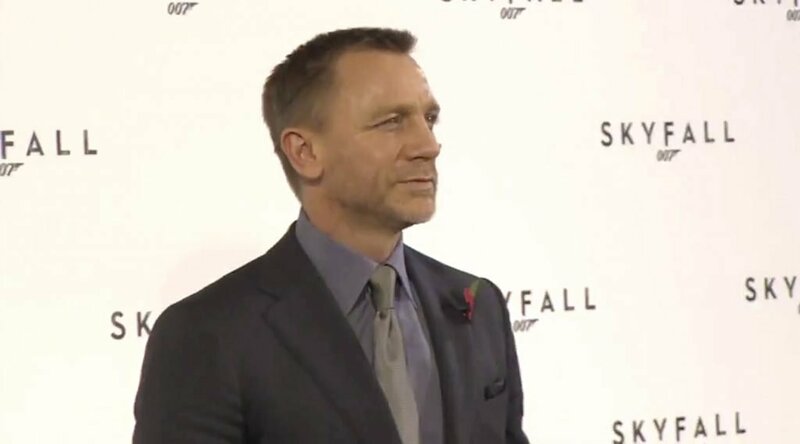 To complement Daniel Craig’s low-contrast complexion he went for a low-contrast outfit overall, with a mid-blue and white end-on-end shirt and a grey tie. The shirt has a moderate spread collar, front placket and double cuffs. The tie is grey with a white tick pattern, and it is tied in a four-in-hand knot. Though the shirt and tie of equal values is a rather bland combination—in black-and-white the shirt and tie look the same—it allows his face to pop more than his outfit does. Flattering the face should always be the number one goal, and this outfit mostly achieves that. The shirt’s blue, however, is a very cool and dull blue, and a warmer and more saturated blue—like the sky blue shirts in Skyfall—would have been more flattering to Craig’s warm complexion. There is a complete lack of contrast in the dark grey pocket handkerchief, where a little contrast would certainly improve the look. 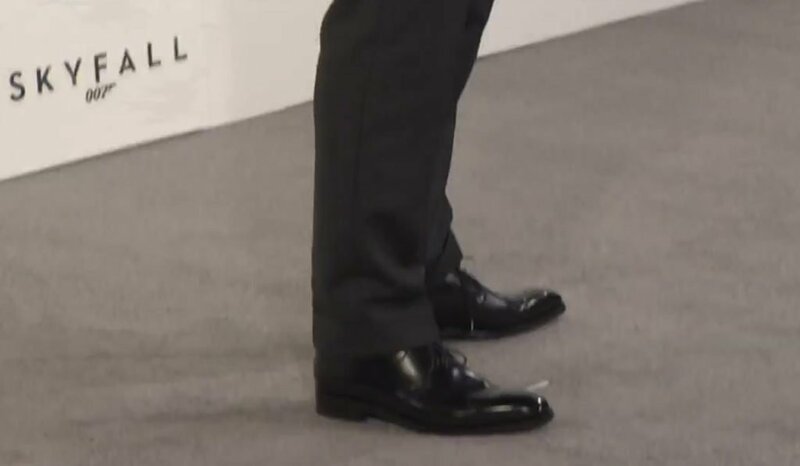 One part of this press conference outfit previewed something Daniel Craig would later wear in Skyfall: Craig wore the same black Crockett & Jones Highbury model three-eyelet derby shoes that he would wear with most of his suits in the upcoming film. Daniel Craig, as well as the others at the press conference, wore a Royal British Legion poppy pin with two red paper petals and a green paper leaf on his lapel to commemorate those who were killed in war and to support those currently serving. The Royal British Legion is a charity that provides support to veterans of the British Armed Forces and their families. Though the pin resembles a flower, it does not act as a boutonniere. Matt, while the Poppy is trademarked by the Royal British Legion in the UK and the Royal Canadian Legion here in Canada, it is not really correct to say that it is worn in support of those organizations. The red poppy is worn in Commonwealth countries in early November each year to commemorate Remembrance Day on November 11. In essence, it is worn in remembrance of those who gave their lives and in support of those who have served and continue to serve in the armed forces. Regarding the Skyfall suits and the fit. There are some pics of the light grey suit pre-credit sequence on Google images where the suit looks a very good fit. Anyone else noticed? That suit, and maybe the striped one as well, was made in different sizes for different shots. There are photos taken on the production with Daniel Craig in the larger size (his proper size) that fits him. I don’t think it’s a Sinclair suit, and other tailors in the 1960s cut similar suits to Sinclair’s. The shoulders on the tan suit are much stronger than Sinclair’s shoulders are, and it doesn’t fit like a bespoke suit. It looks pretty good for being a thug’s suit. I suppose you are right. I just find it interesting how the fit of the suit really work on the man’s very muscular and broad stature. Many overly muscular men does not look good in suits, I think, unless the suit fits extremely well in proportion to the body, wich I think this suit does. I love the way as the lapel rolls gently to the top button, similar to the lapel on a button-3 jacket. Craig looks quite sharp in this suit. It is does fit him better than most of the Skyfall suits.